Be Enticed by Flahavan’s Gifts with Purchase! 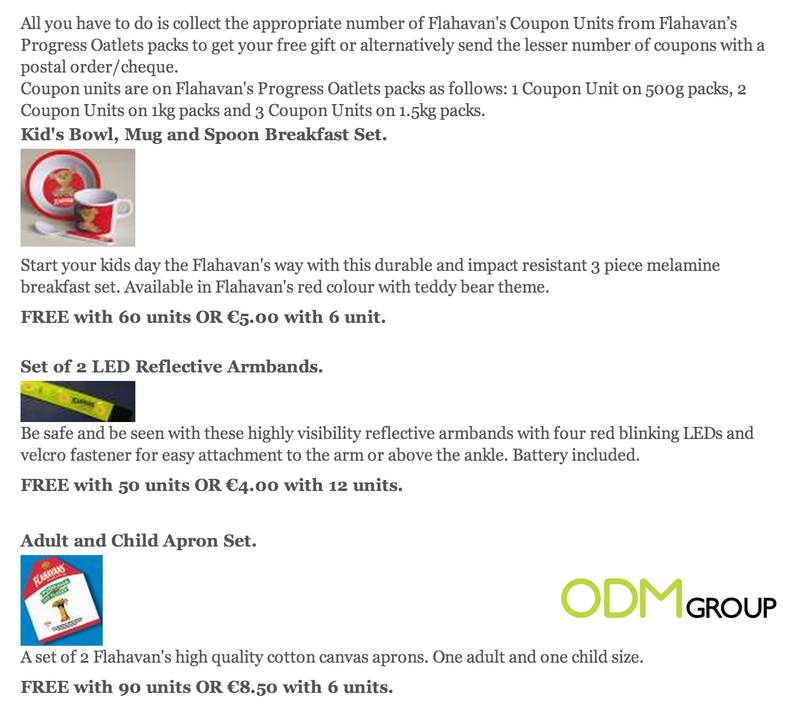 Flahavan’s is now offering a selection of gifts with purchase for their oat consumers. Simply collect Coupon Units when you purchase from Flahavan’s Progress Oatlets to make your redemption! 1 Coupon Unit on 500g packs, 2 Coupon Units on 1kg packs and 3 Coupon Units on 1.5kg packs. Hurry start your collection of Coupon Units to redeem these promotional gifts! Take a look at how you can participate in this promotion to make your redemption! Cereal companies have always been offering on pack promos to their consumers. Check out some promotions done by other companies all over the world! By offering gifts with purchase to consumers, it would help boost sales. These promotional gifts act as incentives to encourage purchases. Consumers would be enticed to spend more in order to be entitled to the gifts! Some people would even be willing to top up their spending to receive the free gifts. And this help boost sales. 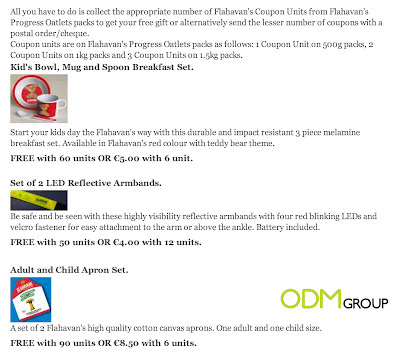 Flahavan’s is now offering a variety of promotional gifts for consumers to choose from. This would allow people to choose their own preferred gifts to suit their own preferences. Branding your promotional gifts is vital in increasing brand awareness for your company. These products provide a sufficient amount of surface area for you to brand your company logo. By branding these gifts, it would be able to help boost sales further. When people use these branded items, other people would also be able to notice your brand name. In the long run, brand recall and loyalty could be built. These branded gifts could allow your customers to be satisfied. And at the same time, act as a free walking advertisement for you! Hurry get started with your very own branded marketing gifts to increase profits!